Good morning! Ack, it is Tuesday again so this is Lorie with you today and seriously how did we get to the last day of May? Only 10 more days until my youngest son graduates from high school...what?!? There is still so much I'd like to do but I'm not going to stress myself out so I'm sure something will have to be not quite homemade. :) Speaking of graduation and Tuesday. 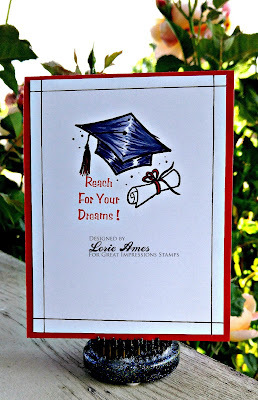 I've made another graduation card with the Cap & Scroll E326 stamp from Great Impressions Stamps...check it out! I've used the sketch this week at CAS(E) this Sketch! to make this card and again, used my new t-square to make a frame (can you tell I love that thing?). 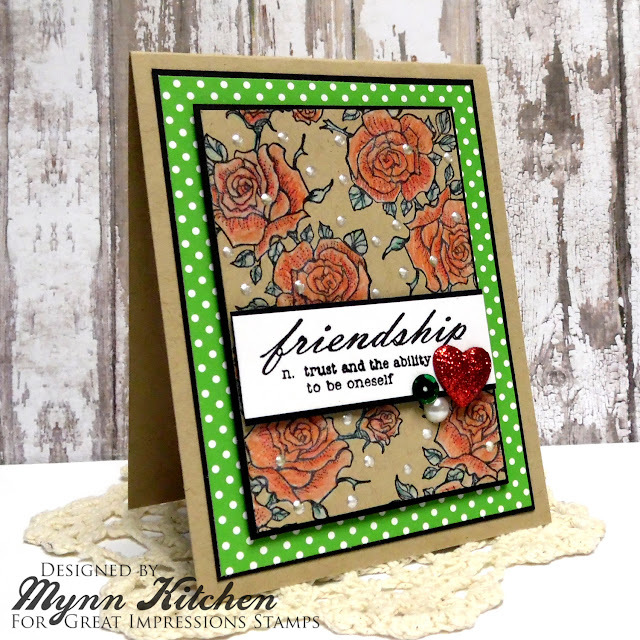 It seems like a perfect layout for a fun and simple layout with sequins and the stamp really being the star of the show. 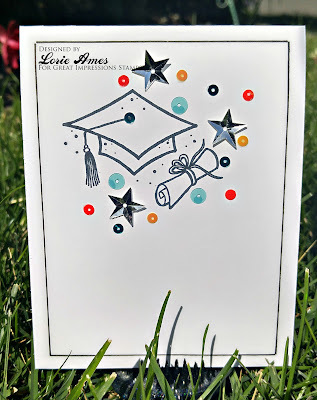 Clean, simple, and perfect for a graduate! Well, that is what I have to share with you today! Well, thank you for stopping by and make sure you hop on over to check out and play along with our current challenge! 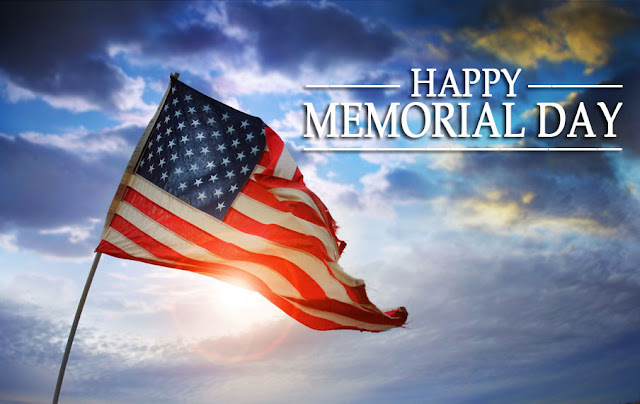 From all of us here at Great Impressions, thank you to those who serve our country so tirelessly and unfailingly. We hope that you all enjoy your day with friends and family! 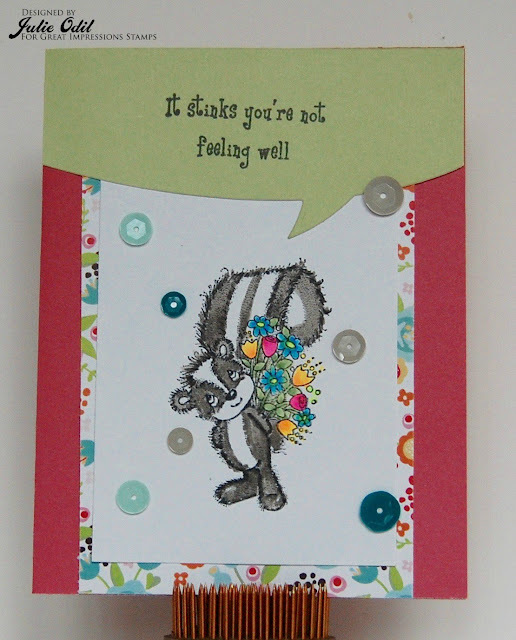 This card uses 2 Great Impressions stamps: B220 - It Stinks sentiment and, colored with Copic markers, F606 - Skunk With Flowers. 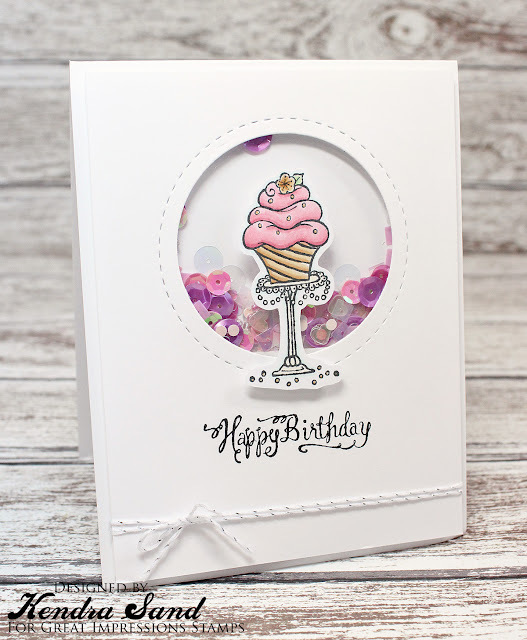 There's just a few more days to join our Birthday with Bling challenge at Great Impressions Stamps, but please join in. And don't forget to shop at the Great Impressions Store for these and other wonderful stamps! 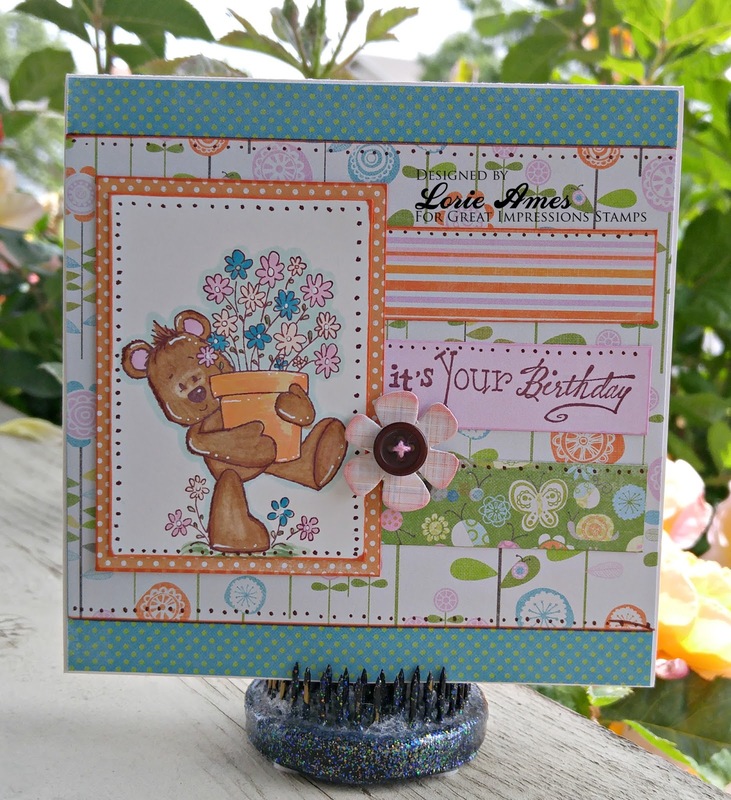 Kendra from Luv 2 Scrap 'n Make Cards here today to share an elegant Birthday card with you! 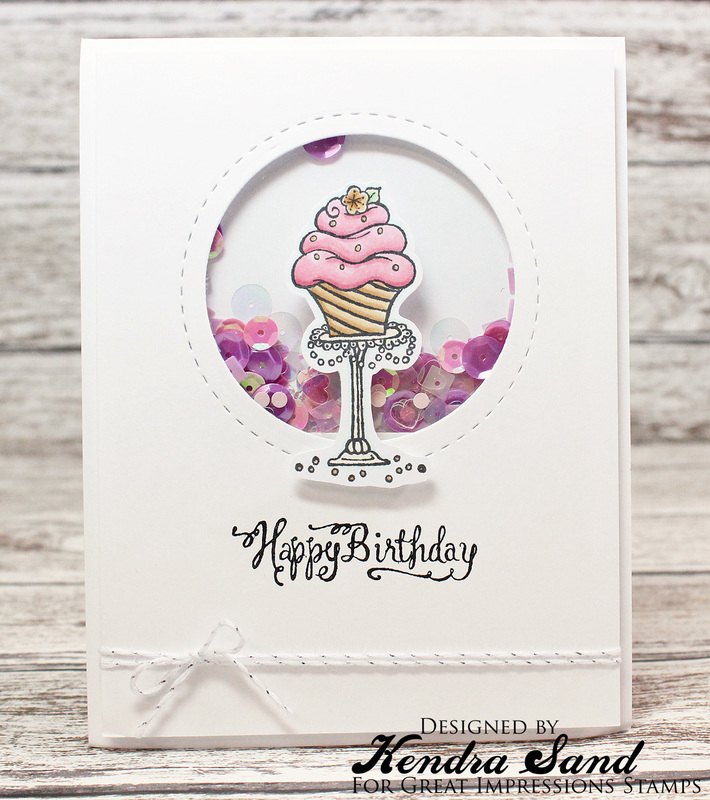 I used the beautiful D413 Elegant Cupcake image as my main focus! I fussy cut out the image after I stamped it and colored it with my Copics! I just love it in front of this shaker window!! I then added this birthday sentiment. 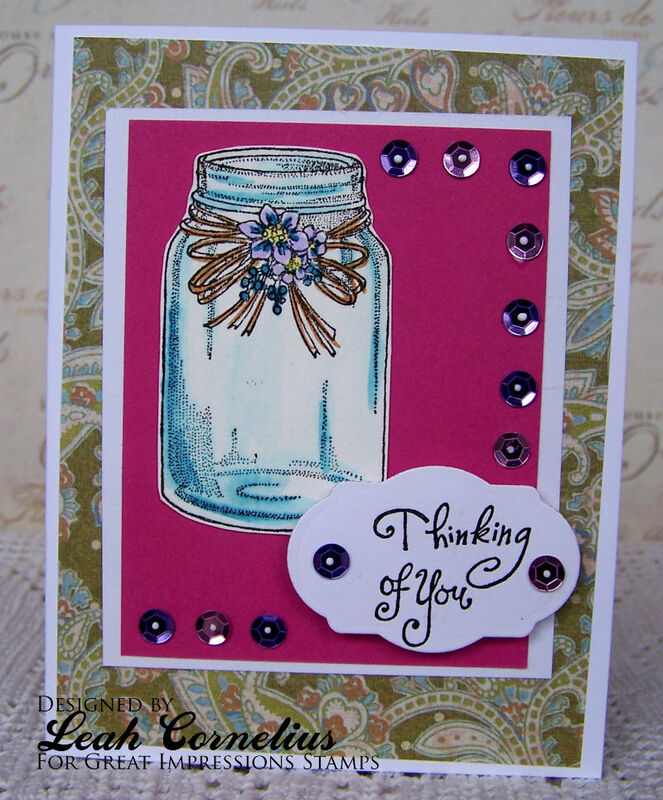 I just love shaker cards!!! Hi there! I have a card to share with you today that is perfect for sending to anyone on your mind. I'm not sure what it is about jar images but I just love them :) This one is called(F616) Mason Jar and I stamped it onto watercolor paper and watercolored it and then trimmed it out. The sentiment is (B195) Playful Thinking of You. I added some sequins to dress it up a bit. Hello friends! I'm just amazed at how fast this month is going by! 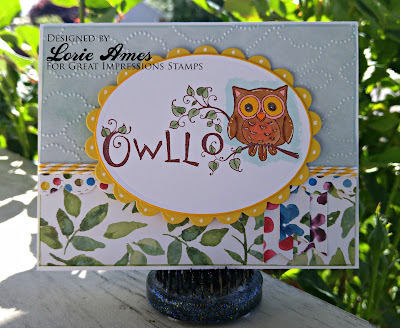 Here it is another Tuesday so this is Lorie from Live-Love-Laugh-Create 2 and I'm back to share with you another card made with a fun Great Impressions Stamp. Look at that adorable F631 Bear With Flowers! He's bringing a pot of lovely spring flowers to the birthday girl! I love the way the papers mimic the sky and ground with the blue and flowered papers. I've also used the C458 It's Your Birthday stamp which I clearly love because I use it often! I decided to mimic the dots on the orange paper but in brown on some of the other papers and I think it gave the card a fun, happy look! Well, that is it for today! Well, there you have it! 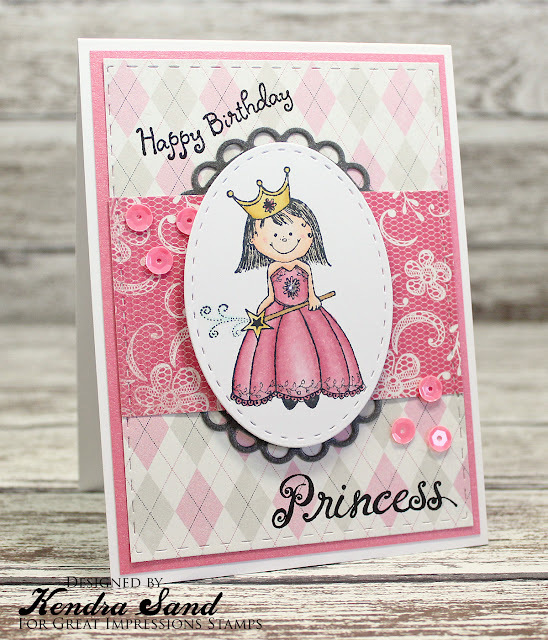 I hope you'll stop by the Great Impressions Stamps blog to play along with our Blinged Birthday challenge! 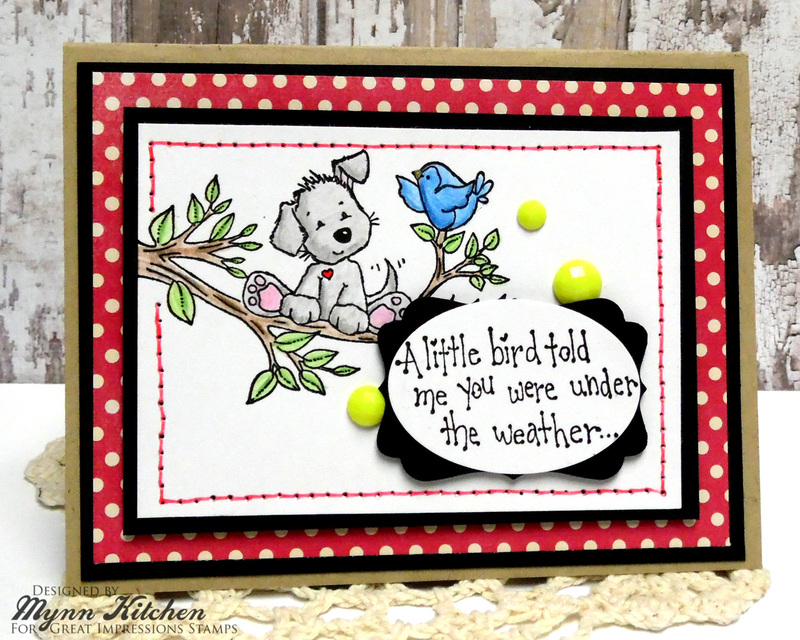 This sweet card uses the *NEW* image G534 Dog & Bird image. I colored it in with colored pencils. This duo is just super sweet! The sentiment is E866 Under the Weather. Some faux stitching and a few yellow rhinestones to mimic sunshine finished off this focal panel. It was layered on top of some fabulous polka dot paper. I totally adore the way this turned out, and I hope you agree! Let me know your thoughts in the comments below. It's Julie here today, spreading Christmas cheer on a Saturday in May. 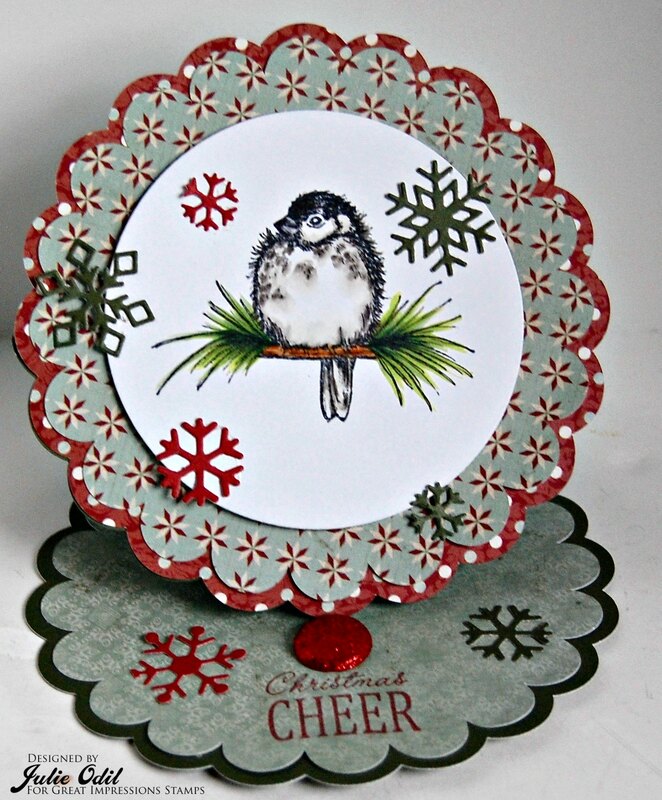 I'm featuring a Christmas card today. I'm trying to get at least one, hopefully 2 cards made each month. 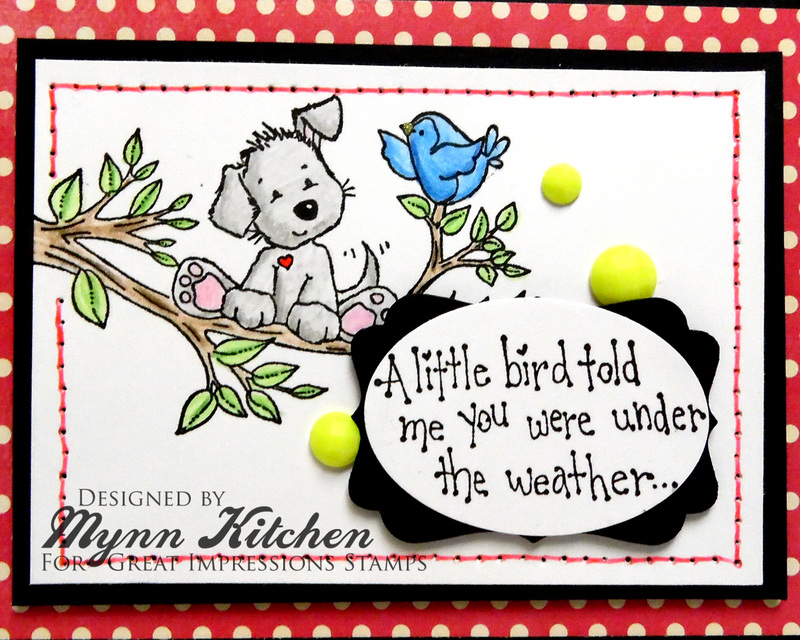 I love this chickadee stamp! It's Great Impressions stamp G28 - Winter Chickadee, colored with Copic markers. The sentiment, stamped in red on the base of the easel card, is A151 - Cheer. The card was cut out on my Silhouette Cameo. The snowflakes are Cheery Lynn dies. The papers have been in my stash forever. 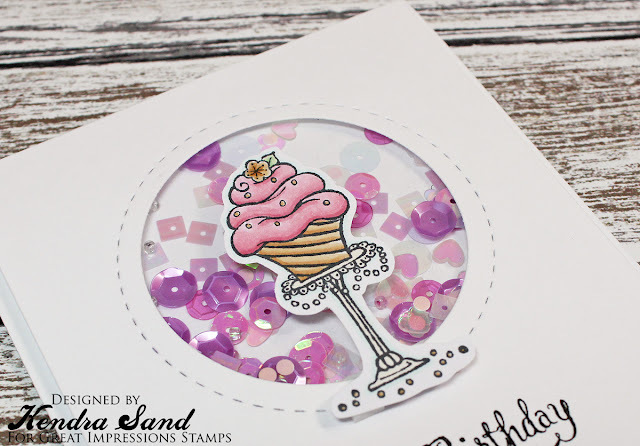 Have you joined our Birthday with Bling challenge yet at Great Impressions Stamps? Please do! It goes all month, and I'd love to see what you make! Don't forget to shop at the Great Impressions Store, too! You'll find these 2 stamps, and many, many more! Kendra from Luv 2 Scrap 'n Make Cards here today to share a princess card with you!! Recently my daughter had a birthday party she was invited to and guess the theme?! 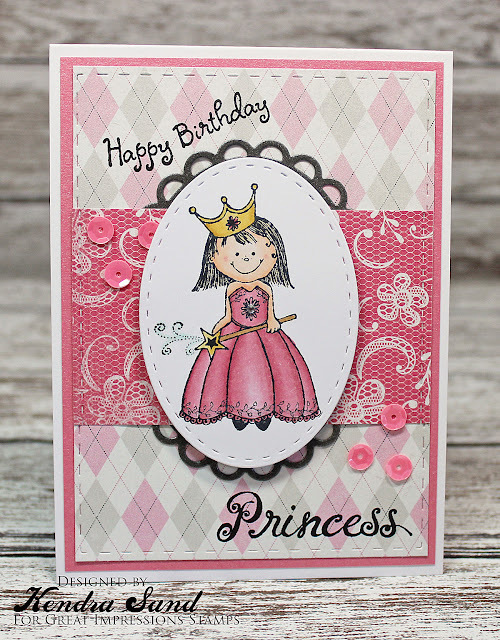 I instantly thought of the adorable F402 Princess Molly stamp! She's perfect for any little girl's birthday card!! 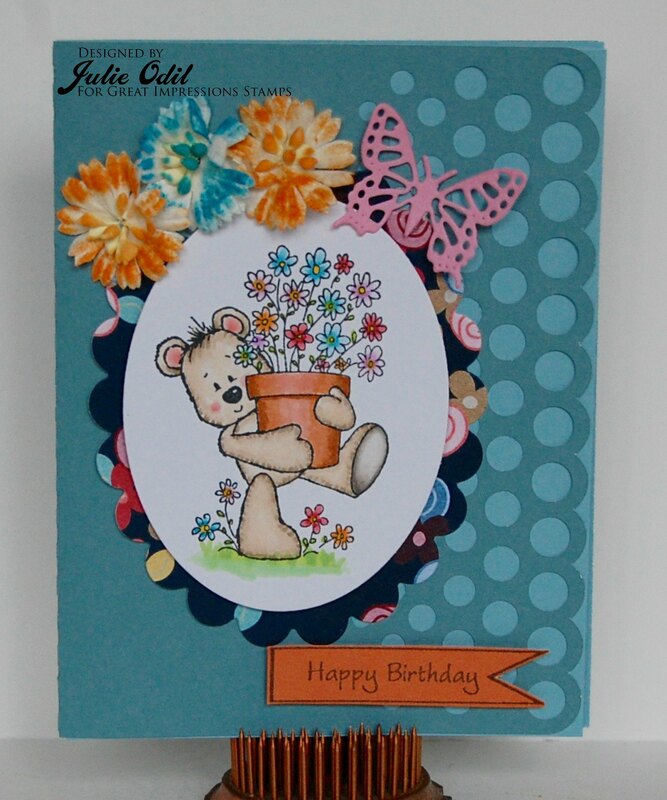 I used the B240 Sweet Happy Birthday for the top of the card! As well as the B192 Princess stamp at the bottom! Finished up my card, by adding some sequins!! Good morning! 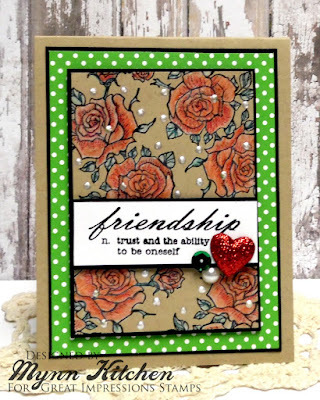 Ruza here to share a Birthday card that feature the H286 Vera & Mable Having Coffee plus E894 Coffee & Friends Sentiment, available at the Great Impressions Stamps. I pulled out my Copic Markers for today's card. I had so much fun coloring Vera & Mable Having Coffee. A bit of fussy cutting and paper-piecing for Mable's flower and earrings, which I ran thru my Xyron Sticker Maker. I pulled the colors from my image to create the background, and then used some Liquid Pearls for the jewelry. I then added the Coffee & Friends Sentiment to the inside of the card. Hello! 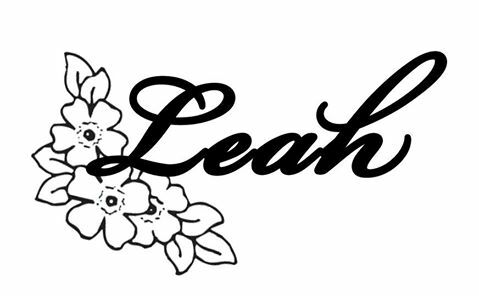 Leah here today and I have a pretty thank you card to share with you. Sometimes it is so nice to have an image and sentiment all in one! This one is called (G364) Spring Special Thanks. I stamped it onto watercolor paper and watercolored it. After I was done I used some Distress ink to ink it lightly and mounted it to my card base. A strip of glittery gold washi tape finishes it off. Hello! It is Tuesday so that means this is Lorie stopping in today. 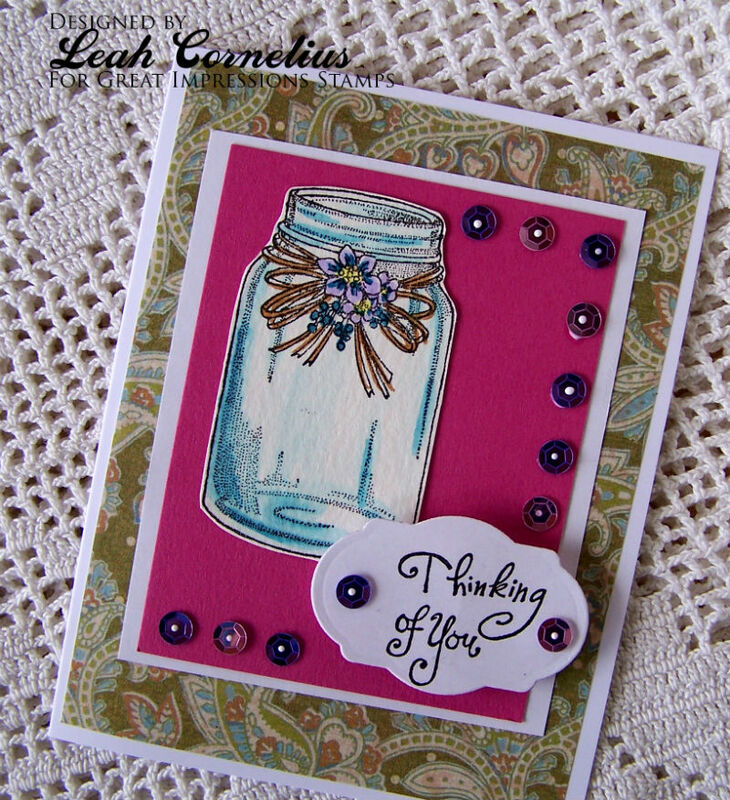 Once again I'm excited to stop in and share with you a card I made with some wonderful Great Impressions Stamps! Next month my youngest son is graduating high school so I, of course, have some graduation craftiness to make...starting with this fun card! Don't ya just love it? Clean, simple, and a bit abstract in the coloring, don't ya think? I've used two GI stamps the Cap & Scroll E326, and Dreams B180. I used a Real Red cardstock base and a white for the layer. The grid detailing was made with t-ruler that I purchased recently. I like the look! It may just be one of my favorite Great Impressions cards! Well, that is what I have to share with you today! 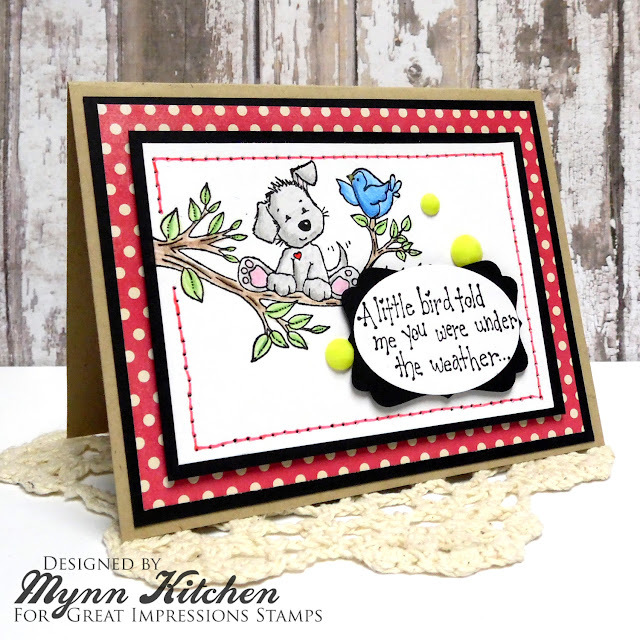 Thank you for stopping by and make sure you hop on over to the Great Impressions blog to check out and play along with our current challenge! 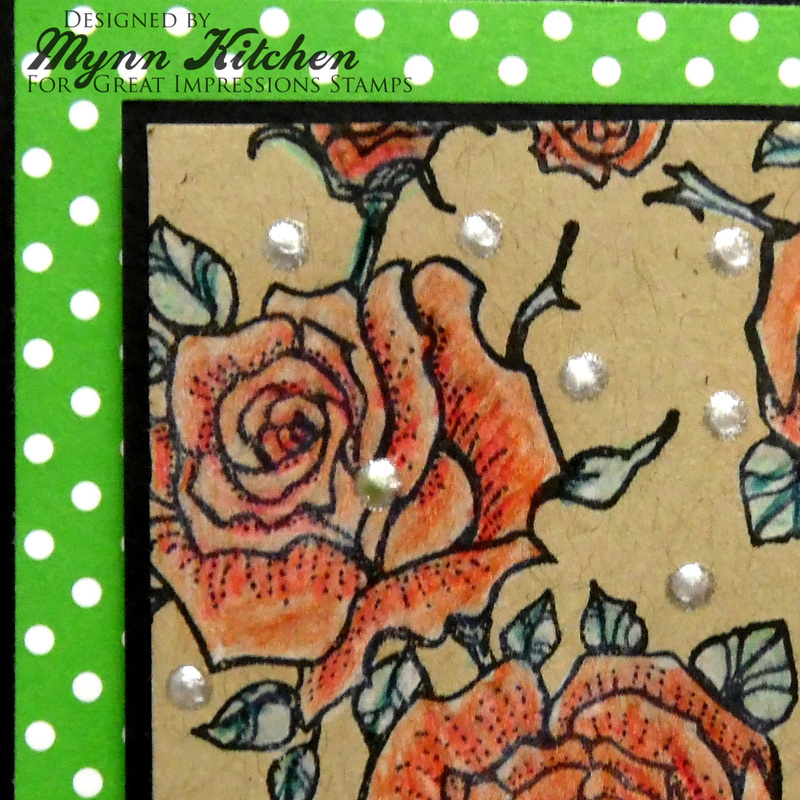 I started by stamping G454 Rose Trio onto kraft cardstock and colored it in with colored pencils. 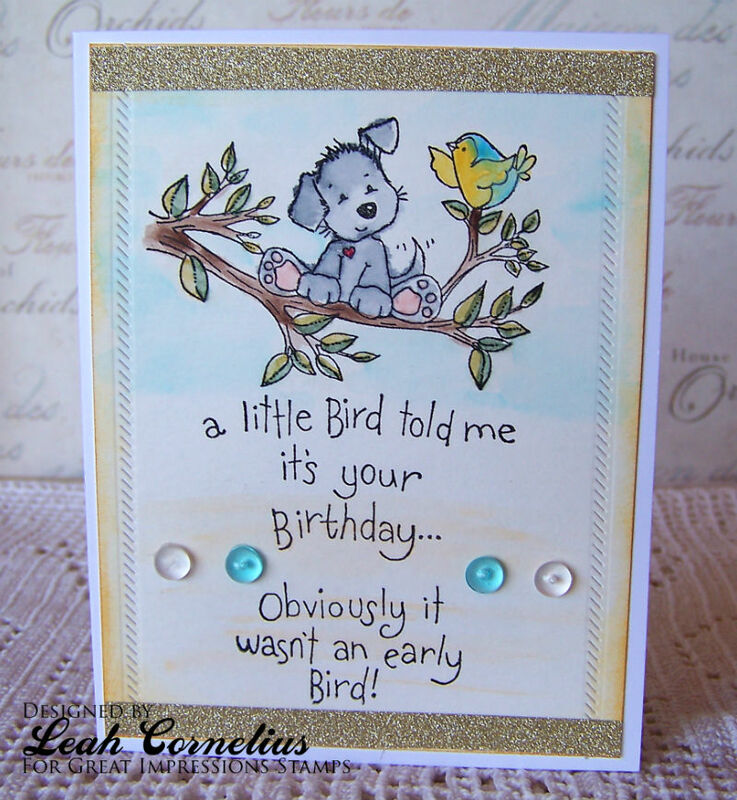 I added some liquid pearls for a bit more shine and to tie in the polka dot paper used on the card base. The sentiment I used is E841 To Be Oneself. I truly believe this is the definition of friendship! I stamped it onto white cardstock, and then accented it with a few fun embellishments. I really like the way this turned out. I think the red, white, and green are a bit Christmas-y sometimes, but I feel that they work well here. What do you think? Please leave me a comment below to let me know! Happy Saturday, crafty friends! Julie here today from Muddy Paws & Inky Fingers, sharing a birthday card. This card is also my entry for the C.R.A.F.T. challenge that Great Impressions Stamps is sponsoring. The theme is - birthday. This card uses 2 Great Impressions Stamps: F631 - Bear With Flowers, and G483 - Tags. I colored F631 - Bear With Flowers with Copic markers. 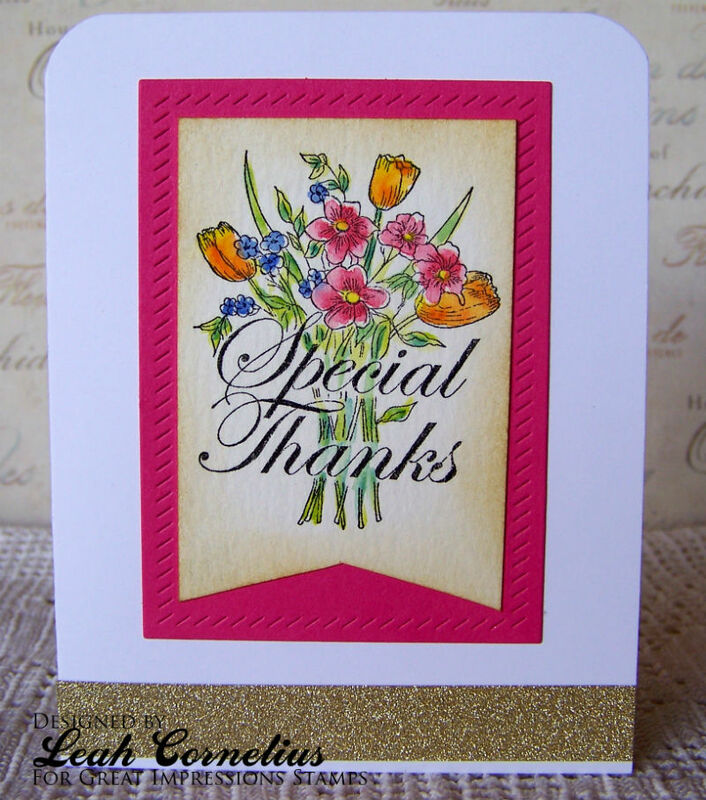 The card base was cut out on my Silhouette Cameo. The Prima flowers started out white, but were inked with several colors of Tim Holtz Distress Inks. The butterfly is a Cheery Lynn die. 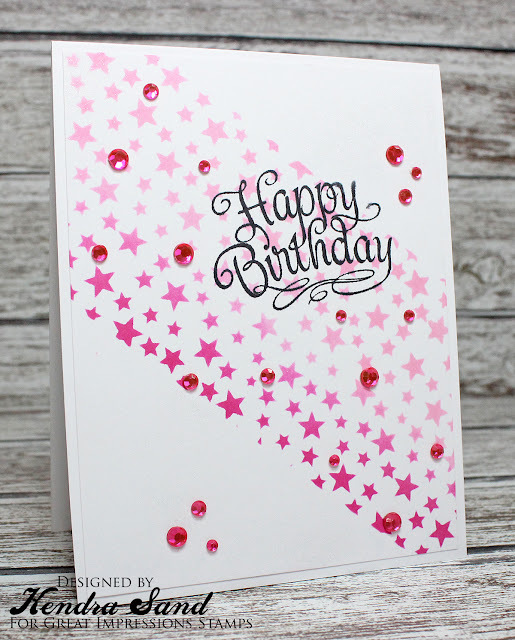 Have you joined the Great Impressions Stamps Birthday with Bling challenge yet? Make a card and enter it in both challenges! Double duty! Yea! 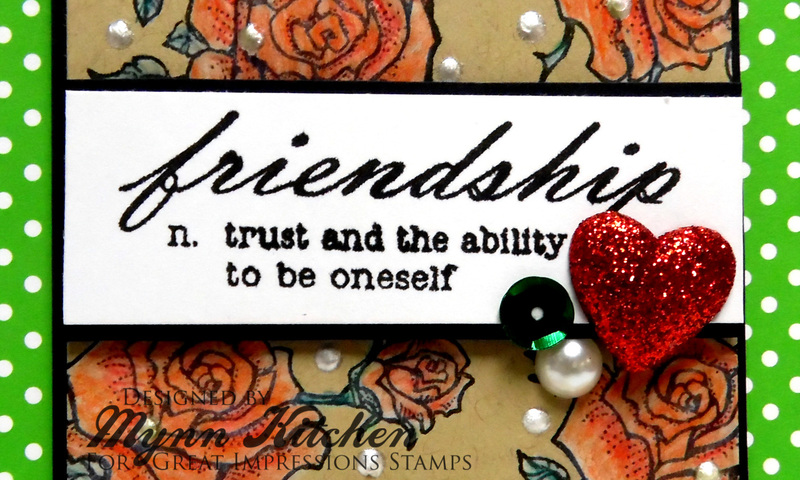 Shop in the Great Impressions Store for many, many wonderful stamps for birthdays and ANY occasion! Kendra from Luv 2 Scrap 'n Make Cards here today to share a Blingy card with you!! I created my card with this month's Blinged Birthday Challenge in mind!! 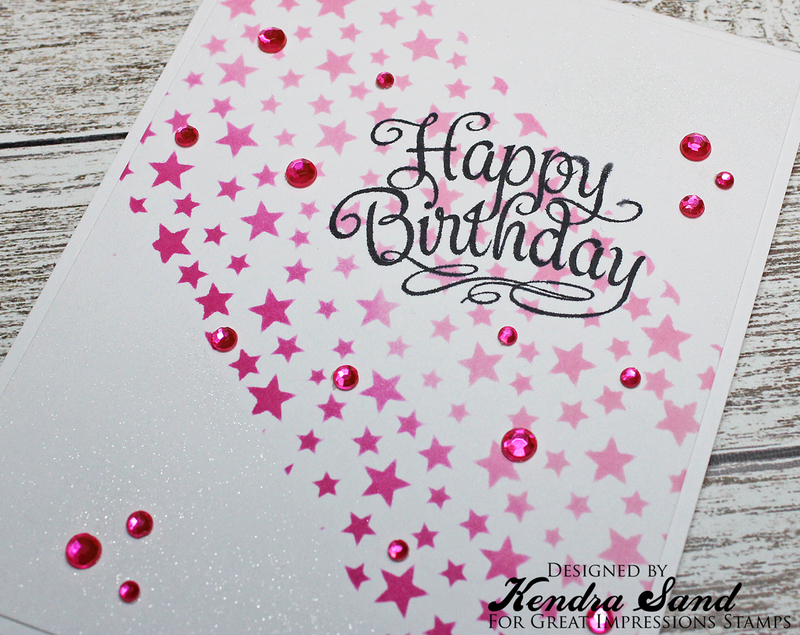 I stenciled the stars onto my cardstock using shades of pink distress inks. I then stamped the beautiful Swirly Happy Birthday (E367) sentiment!! I love the font used on this sentiment, so beautiful!! I added a bunch of pink bling! And as you can see in the bottom left of this picture, I also sprayed the card with some glitter spritz! So it is VERY shimmery!! Be sure to join in our Blinged Birthday challenge here!! Good morning! 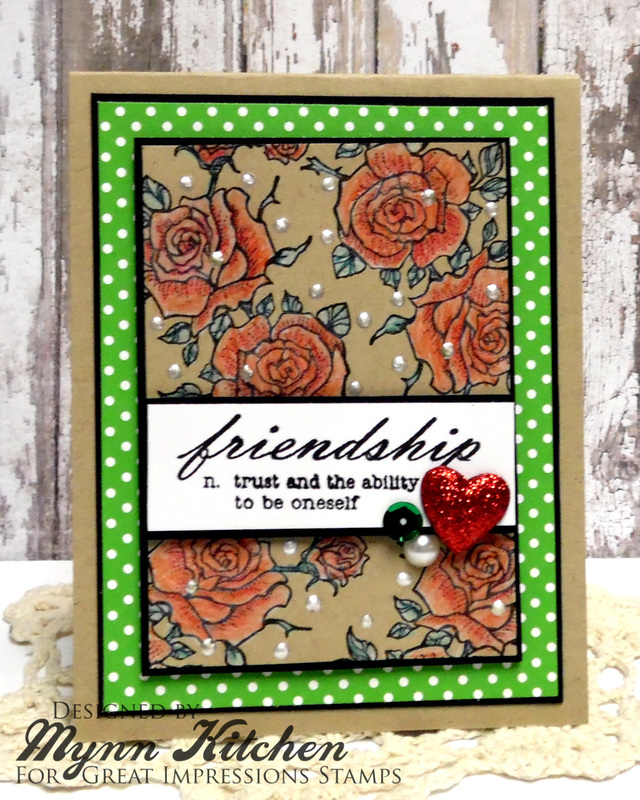 Ruza here to share a Birthday card that feature the H257 Someone Like You Sentiment, available at the Great Impressions Stamps. Leaving the Someone Like You Sentiment as my focal point for today's card, I pulled out some Coral, Smoked Sea Salt and Spearmint cardstock to create my background. Of course once I was done, I thought maybe I should have embossed the base panel. I love the clean and simple design which is perfect for putting in the mail. 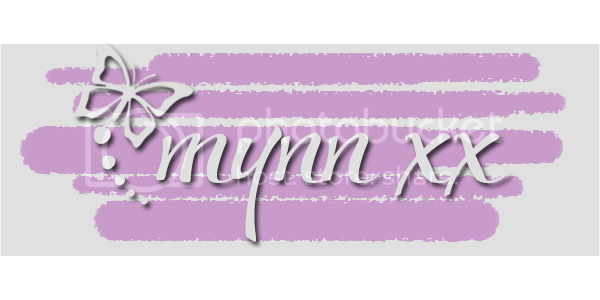 Loving this design I think I'm going to make a set of cards in different colors, and add that embossing that I left out (wink). Great Impressions is Sponsoring this week's C.R.A.F.T. Challenge, so make sure you hop on over for all of the details, and play along for another chance at winning some Great Impression Stamps of your own. Hi! Today I have a fun birthday card to share with you that also goes along with the current CRAFT challenge that Great Impressions is sponsoring this week. I used some super cute new images for my card. 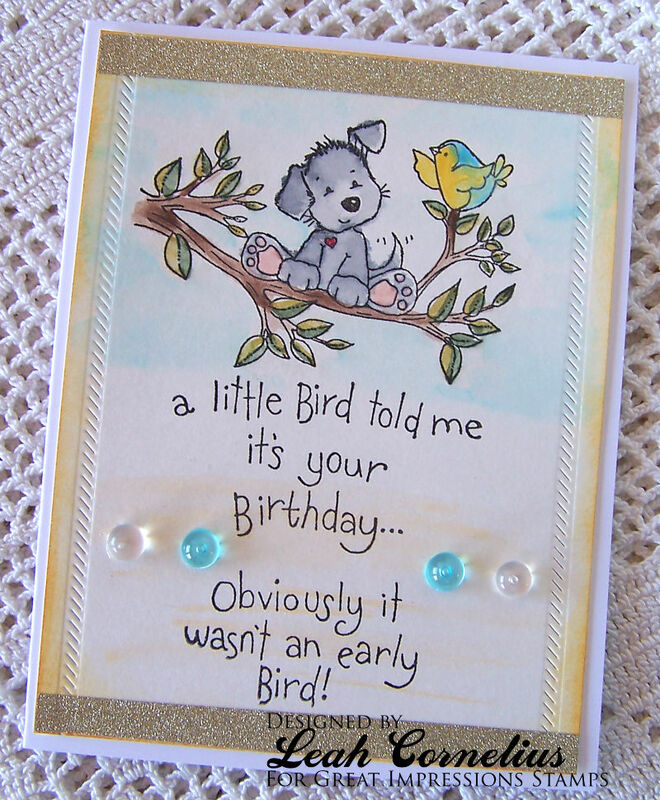 The adorable pup and bird are called (G534) Dog and Bird and the matching sentiment is (G535) Early Bird. I watercolored the image and added some embossed edging to the sides. Good morning friends! 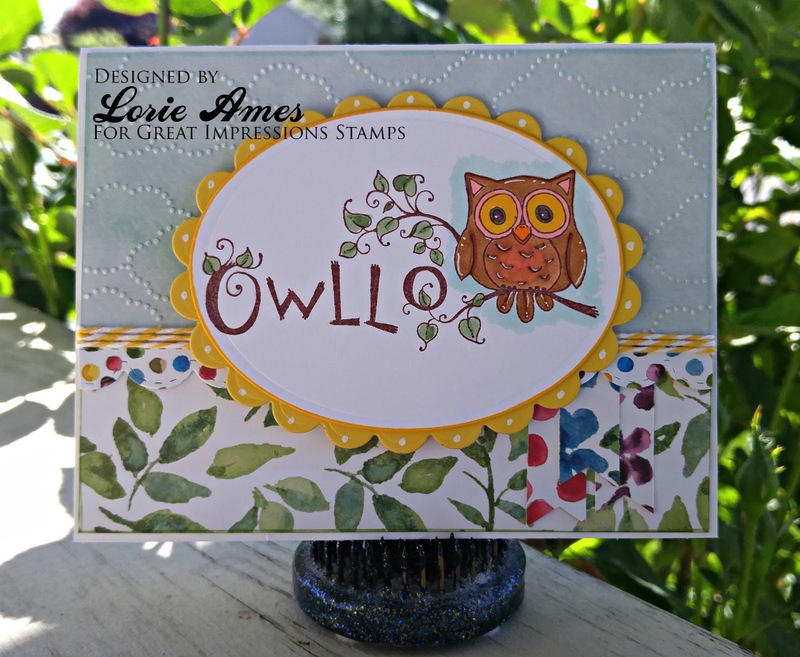 Today is Tuesday so this is Lorie and I get to share with you a fun card made with a Great Impressions Stamp! There are so many times that I'm just looking for a 'hello' card and this super cute image is perfect! This is called Owllo (G553). I thought it would be fun to use blue paper up top of the card and then I embossed it with a cloud embossing folder. The yellow scallop is reminiscent of the sun and then of course the leaf paper to ground it a bit. Well, thank you for stopping by today! Make sure you stop click over check out our current challenge!